Around 1837, Asher B. Durand made a number of trips in the company of Thomas Cole, the founding figure of the Hudson River School, during which he developed a new approach to painting. 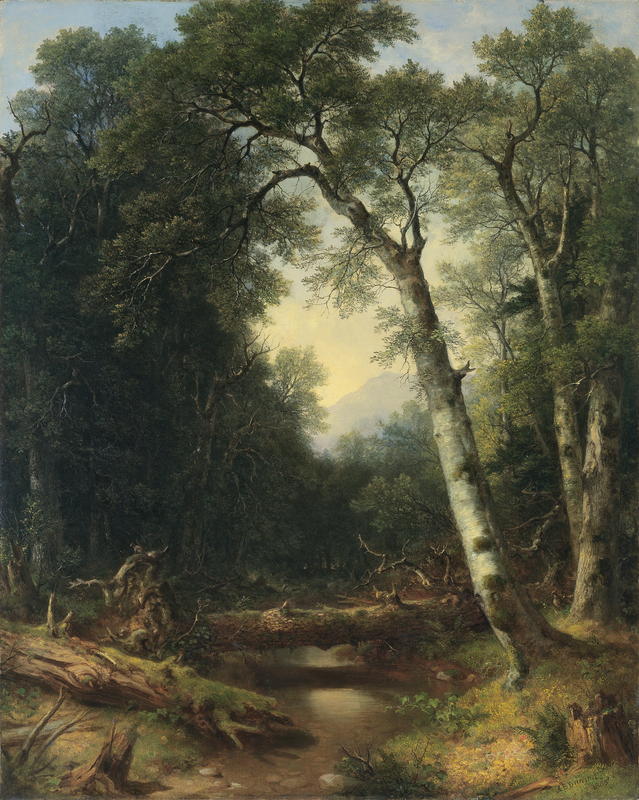 The studies from life resulting from these trips became the bases for future compositions such as A Creek in the Woods, which is notable for its use of realism and minute detail. A large silver birch, one of the artist’s favourite trees, is located beside a creek with fallen trees across it. Hidden among them are a tiny squirrel and a pheasant that are almost impossible to see at first glance. These scenes of woodland interiors, which Durand depicted on numerous occasions, are imbued with a sense of intimate tranquillity. The sky only appears through the branches of the trees or above the mountaintops. The absence of human forms and the majestic presentation of nature conform to a vision of America as an untamed, virgin land. In this natural paradise the inhabitants are closer to God’s divine grace through a spiritual connection with their surroundings. “Have just returned from a tour in search of the picturesque, ” wrote Thomas Cole in his diary on 8 July 1837, “[...] To Mr Durand the scenery was entirely new and I am happy in having been the means of introducing the rich and varied scenes of Schroon to a true lover of Nature.” This tour of Lake Schroon in the Adirondacks, accompanied by Thomas Cole, marked the conversion of Asher B. Durand, hitherto an engraver, to landscape painting. Whereas contemplating the scenery spurred Cole to seek a higher style of landscape painting that embraced moral reflection, studying nature led Durand to convey a wilderness uncontaminated by man that preserved intact its virginity and diversity, characteristic of the picturesque. However, Durand’s aim was not simply to produce a meticulous rendering of nature; rather, influenced by the ideas of his master, Thomas Cole, he wished to imbue the landscape with a religious and moral meaning. The fallen trees that dominate the left-hand side of the painting can therefore be taken as a reference to the cycle of life, to God’s control over nature’s schemes; similarly, the light and calm waters of the stream may be regarded as the divine attributes of the earth. In addition, both the pheasant resting peacefully between the two large trees and the playful squirrel perched on the roots of the fallen tree indicate the absence of human life in the forest. This savage and divine natural landscape, in which there is not a single trace of man, is conceived under the consideration of America as a new Eden, where the scenery is a manner of communicating with the Divinity.